Life of Garment Workers in Bangladesh: What can we do? This paper is an endeavor to depict the conditions of the garment workers from two perspectives. One is social perspective and the other is economic perspective. This study suggests that the standard of living of the garment workers is still in precarious condition and they are not free from the vicious circle of poverty and face extreme difficulties in obtaining their basic needs for survival even. This paper recommends measures for improving the prevailing socio-economic facilities, to a great extent, to achieve garment workers’ satisfaction at the maximum level. The main objective of the study is to assess the socio-economic conditions of the garment workers. To identify the factors that affects the socio-economic conditions of the garment workers. To assess the social conditions as well as economic position of the garment workers in our society. To recommend measures to be taken for improving the socio-economic conditions and life standard of the garment workers. The readymade garment industry (RMG) has played a pioneering role in the development of industrial sector of Bangladesh. Though it took a rather late start i.e. in 1976, it soon established its reputation in the world market within a short span of time. Consequently, RMG is now one of the main export items of the country. Besides, enriching the country's economy it has been playing a vital role in alleviating unemployment. The Ready Made Garments (RMG) sector is a major foreign exchange revenue generator for Bangladesh contributing 77% to the country’s net exports during 2009-2010. Garment exports, totaling $12.3 billion in FY09 and remittances from overseas Bangladeshis totaling $9.7 billion in FY09 accounted for almost 25% of GDP. Employment in the RMG sector provides female workers with economic benefits and some empowerment. Over 90 percent of the production workers employed in RMG factories are women. Moreover, the industry accounts for about 70 percent of the total female employed in the country’s manufacturing sector. It is well known that, life of a garment worker is very miserable. So, here i will discuss about miserable life of a garment worker and what steps should be taken to improve their life standard. These are described below briefly. I try to clarify these by my practical experience and information from journals and blogs. In our country this factor is highly denied. Many industries allow child labor as well as expired labor. Although, present situation is moderately good. 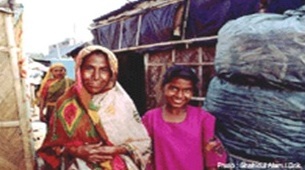 A scenario from Bangladesh Human rights Network is mentioned here. A garments worker has to reach to garments very early morning. He works there long 12 hours from 8 am to 10 pm. Sometimes he has to work up to midnight and he also does not get any vehicle at that time for returning home.He does not get extra holiday except Friday and special occasions like Eid. If he does not go to work for any emergency personal work, then he does not get money for those days. As a result their life becomes bored. A garment worker earns very small amount of money like tk. 4000 to tk. 5000 only. Within this money he has to lead their life. He has to manage all the things within the small amount of his fee including feeding his family members, giving house rent, transport cost, cost of clothes etc. A question is arising from here, how they manage their life? They need to do more work. i.e., over time job or do another part time job. Wages ratio of some countries. The amount of wage of garment worker is very low considering other countries. Rented residence of garment worker. Socially garments workers are neglected. They are considered as a lower class people in our society. Especially female worker are hazarded by their co-workers and by eve-teaser. Now-a-days peoples are not happy about their profession. “Sultana was the eldest of three children, whosefather died while she was still at school. As aresult she had to give up her education, as hermother was unable to bear the costs of keepingher brother and sister on her own. Sultanafound work at the lowest level in a clothesfactory, and was forced to work night shifts. Shefell ill after two and a half months and had toleave her job. She then joined another garmentfactory, but again fell sick after five months.“Whenever I started working in these garmentfactories, I became sick,” says Sultana. “YetI had no choice but to continue my work as Ihad to bear all the family expenses, includingthe education costs for my brother and sister.When I fell ill at my last factory, I applied forsick leave but I was denied it. I returned to thefactory after four or five days and was deniedmy wages.”Sultana joined the NGWF section at the localshopping mall, in the hope of increasing herearnings”. From this story we can easily realized that Sultana was not satisfy with her job. Industrial life of garment workers is very unhappy and unsafe in our country. Burning is a common phenomenon in our country. Burn takes many workers life. Dead body of some worker deu to burn. Most of the time Females are sexually hazarded in the industry. Rally against worst condition on industry. From the above discussion, we see that life of garments worker is full of unhappiness and pain. So, we need to change this worst condition. The following steps should be taken to improve this condition. Government or BGMEA can introduce a campaign named “IDEA HUNT” for solving present or upcoming problems of garments worker. They can gather idea from people. For this a prize should be adopted for best idea presenter. Government should ensure social security for garment worker. Government can established colony for garment worker, which ensure minimum living standard. Government should setup a wage scale in comparing with other countries and workers monthly expense. Owner of garment industry should introduce entertainment facility in the industry. Some industries already introduce this step. There is no alternative to training to any types of work in order to train up the worker to fit in the job for which he/she has been employed. Most of the garment workers who work in many factories are not that skilled to do the job as required by the management; as a result in most cases the product produced are of inferior quality. Although there is demand of our garment products in the world, the demand would have been much higher if our products are produced with precision. To bring that precision the BGMEA must create training institution where for the workers whose 90% are young women, must be made mandatory to get admitted into the training institution for at least three months in their respective field for which they want to be employed. It is only then we can expect our products will be highly appreciated and ordered at a price higher than the prevailing price which means more foreign exchange for our country. Introduction of medical treatment:Medical treatment should be introduced for garment worker. Due to this,they feel comfort in the industry. Most of the garment workers are illiterate. So, government should establish an educational institute only for garment industry worker. Due to this, they will be cautious about their life standard and their duty. The can be abled to take advanced technology easily. Burn is a vital worried factor in garment industry. So the owner of garment industry should ensure required safety measurement. From the above discussion we may finalized here that, Garment worker plays a key role in our national economy. So, we should ensure their desirable honor. We should be respectful about them. They contribute a lot for our country. We should give something in contrary. http://nazifahmed.wordpress.com/ and also from my experience.